A passion for style. An eye to create art on fabric. A desire to make people look their best. Anu and Reshma came together for their love of fashion and creating unique style statements. Anu and Reshma are a rare breed. They are sisters-in-law, but in their passion for design, they are soul sisters. They put their heads and their talents together a few years ago to create a fashion brand that became a hit with women in Kerala. 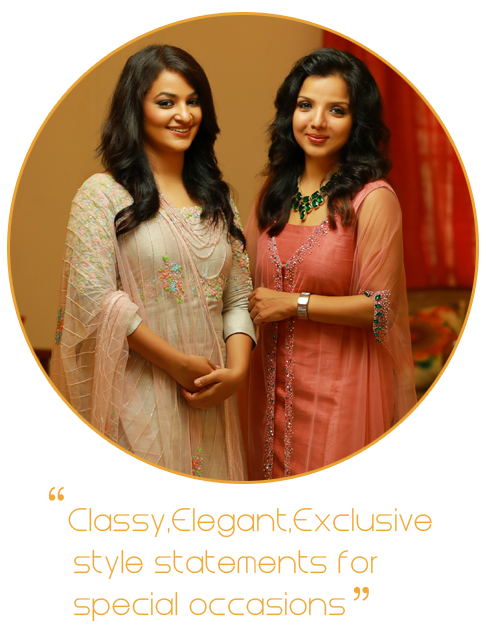 When sisters-in-law Anu Tinu and Reshma Binu opened their boutique ‘Mannath’, in Panampilly Nagar, Kochi, back in 2007 exclusively for Unstitched Salwar suits and kurtis. it was a dream come true for the talented duo, who had always envisioned having their own place to showcase their shared passion for designing beautiful ethnic wear. It wasn't long before their designs, which are outstanding for their vivid color, intricate handwork and opulent fabrics became the talk of the town and their hitherto small circle of loyal clientele expanded to include big names and many dynamic, stylish celebrities who took pride in wearing Mannath's signature creations to various high profile dos and galas. Despite the firmly entrenched boutique culture in the city, women of all ages made a beeline for the boutique's gilded doors, knowing well that therein lay the magic that would transform their dream to stunning haute couture reality. Then, two years ago, in April 2012, with weddings becoming increasingly more glamorous and elaborate, sensing a palpable need for designer bridal wear in the Kochi market, ever enterprising, the two opened their second boutique, Label'M, exclusively for bridal and evening wear in Vytilla, giving the women of Kerala trendy, modern and exciting options in bridal and party apparel.In just a few years, Label'M has become a celebrated name across Kerala, even becoming a favourite with celebrities. The charm of bridal designs and party wear outfits are brought to life through Label’M and the elegance of kurtis and unstitched salwars are brought out through the brand Mannath . For those who don't fancy 'off the rack' shopping, especially for special events, Label'M offers ‘the exclusive’ .Playing with fabric, colours and creativity to design customised styles is what Label'M specialises in. So whether you like to keep it simple or add a pop of colour, or go all out and be a showstopper, we tailor-make apparels just the way you like them. Label’M offers a wide variety of Lehengas, Gowns,Anarkalis, Sarees and Straighcut Tops. We do customised designing and tailoring for both brides and grooms. Be it a conventional wedding or a theme-based one, Label'M can design and make wedding attire to suit the occasion and your taste.